I visit Melbourne for work a few times a year. Between meetings and events, I always try to squeeze in some downtime to catch up with my beautiful mother in law Honor. Considering the fact that it's my husbands home town, you'd think I'd know the city better by now. But I have my few favourites, and one of them is Grasshoppers Feast. On my most recent trip, I scheduled a meeting with the amazing Melbourne based artist Caroline at this awesome brunch spot, nestled in the Causeway right by Bourke Street Mall. I would have never guessed that I could introduce something new to a local. 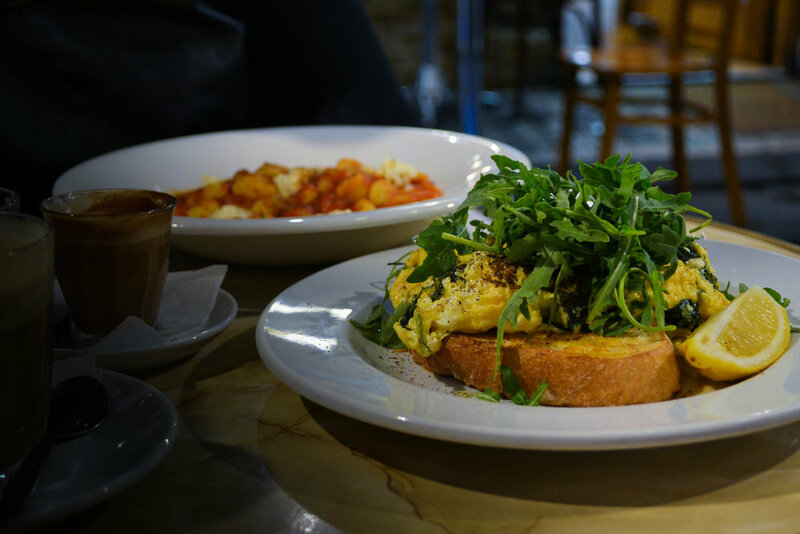 As per usual, I ordered a lunch of breakfast - scrambled eggs with feta on sourdough, topped with rocket (as per my request) and Carolyn had the gluten free gnocchi, which she swore was excellent. Sometimes it's just nice to know that you'll always get a great coffee, beautiful service and a delicious dish, no matter the visit. Later that afternoon, I went back with my mother in law. She too swore the gluten free gnocchi was awesome. I believe her.